György Debrődy - The Survivor. The photo above was taken on the eastern Front in early March, 1944, about the 5/2. Squadron's pilots The pilots from left: Senior Aircraftsman Sándor Tanács (3 kills), Captain József Kovács (back), the Squadron commander (4 kills), 2ndLt Kálmán Szeverényi (7 kills), 2ndLt György Debrődy (26 kills), Sergeant János Mátyás (5 kills). This snap was made by a Hungarian officer, Emil Terray. When I met with this kind old man, I got this photo from him, and now this photo is in my collection. He was born on 1st January, 1921 in Lajoskomárom. Since his young age he was a keen boyscout and he was very interested in flying. After his high school graduation in 1939 he continued his studies at the Hungarian Military Flying Academy in Kassa, and graduated as a 2nd Lt on 18th June, 1942. After his graduation Debrődy was relocated to the 5/I Fighter Groups 5/2. Fighter Squadron and in December he went to the Eastern Front. At first he flew fighter-bomber missions, and didn't meet Soviet planes, but this situation changed the next summer: during the battle of Kursk he claimed 6 victories and became ace. Dobrody. On 25th September,1943 he had a dangerous affair. In that morning he was downed by a Soviet Yak-9 15 km behind the enemy lines. Debrődy had to make an emergency landing near a Soviet AA battery. After an adventurous escape, the next day he dissolved the River Dniepr and achieved the German lines. On 1st February, 1944 his swarm had a fierce dogfight against 5 GvIAPs La-5s, led by Witalii Popkov over the Korssun kettle. One La-5 hit his plane, and the Messers engine failed. Debrődy had to make his second belly-landing behind the enemy lines! 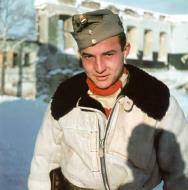 His best friend, 2nd Lt. Miklós Kenyeres with 19 air victories, downed Debrődys attacker, and landed near the dead Messer on the snowy and icy unknown field. Some Soviet soldiers were running towards the Messers, but Kenyeres managed to take off with some PPS machine-pistol hits in his plane. Unfortunately, two days later the Soviet AA fire downed Kenyeres plane behind the enemy lines and this brave pilot had to bail out over a forest. Debrődy was desperately circling around his parachute, but he was not able to help his friend, Kenyeres taken POW. From the 3th of April, 1944 the American 15th USAAF attacked Hungary, and the Hungarian military high command ordered home some veteran fighter pilots, including György Debrődy and László Molnár. 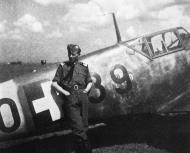 At tis time Debrődy had 173 combat missions and claimed 18 confirmed air victories on the Eastern Front. 2nd Lt György Debrődy was relocated to the Hungarian 101/3. Puma Squadron, based in Veszprém. His first fight against the Americans was on 14th June 1944. On that day the Hungarian 101th Puma Group attacked the 94th Squadron of the 14th FG. The Hungarian fighters downed 5 P-38s and damaged two of them seriously, and the others minorly while they lost two planes and a pilot, 2nd Lt. Gyula Király, was killed. In this fierce dogfight Debrődy downed 1st Lt Louis Bennes P-38J (USAAF s/n: 42-104229 MACR-6031). The American pilot, who was an ace with 5 kills, got wounded and had to bail out. Benne was taken POW, his plane crashed near Dudar. Two days later Debrődy claimed another P-38J: his victim was 2nd Lt George F. Loughmiller. 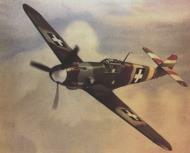 The Americans plane (USAAF s/n: 43-28665 MACR-6811) crashed near Kapoly, the pilot was killed. On 2nd July, 1944 18 Hungarian and approx. 80 German fighters attacked the American planes over Budapest. After this fight Debrődy claimed a P-51D over Pilisvörösvár. It was 1st Lt George Stanford, the Assistant Squadron Operations Officer of the 335th FS of 4th FG Code:WD-K with 4 air victories. The American pilot taken POW (USAAF s/n: 44-13402 MACR-6799). Five days later he downed a B-17G (2nd BG, 20BS, USAAF s/n: 42-97351 MACR-6565) near Megyercs, assisted by Ensign András Huszár. Later he flew some unsuccesful sorties and on 27th July, 1944 he downed a B-24 near Mór. This Liberator was one of the 455th BGs lost planes. Later the Hungarian fighters reserved their forces against the Red Army, because the Soviet forces appeared near the Hungarian border. On 1st November Debrődy was promoted to 1st Lt. Three days later his Squadron leader, Captain József Bejczy (5 confirmed kills) was killed by Soviet AA fire, and Debrődy was promoted to the new Squadron leader. On the next day, on 5th November, 1944 the last big Puma grouped sortie against the 15th AF took place. During this combat mission Debrődy claimed one B-24 (451st BG) shot down. On 16th November, 1944 he took off his last combat mission as a squadron commander. The 101/3. Squadron attacked SE of Jászberény some La-5s of the 5th Vozdushnaja Armija (5th Soviet Air Army) and Debrődy downed one Lavochkin. 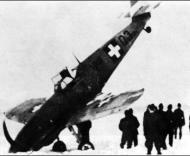 Later he made a frontal attack against a Soviet Yak-9, north of Nagykáta. His series hit the Soviet plane and the Yak exploded, but meanwhile some of the Yaks bullet hit Debrődys Messer. The Hungarian pilot was seriously wound: one 20 mm shell punched his belly near his spine, but despite his terrible wound this tough guy made a successful emergency landing near Hatvan and the doctors where able to save his life, but it was his last combat mission (203rd). Later he was awarded the Tiszti Arany Vitézségi Érem (Officers Gold Medal For Bravery), the highest Hungarian decoration. After the war he emigrated to Spain with his friend, Miklós Kenyeres, and later to Canada, and to the USA. In 1967 the doctors again had to operated and removed from his body, near his spine a Soviet 12.7 mm bullet it was a souvenir from his last combat. He passed away on 2rd February, 1982 in Cortland, USA. (a) Debrődy claimed a P-51D with white-black wing stripes in high altitude (the 4th FG had this signs over Budapest is this day). He said, that the American pilot baled out. Later the Hungarian confirm-commission confirmed to him Stanford's plane, but in fact, Stanford made belly landing. In my opinion, Debrődy's real victim was 2Lt J. C. Norris from 336th FS of 4th FG, who was downed by a Messer, baled out and was taken POW. USAAF s/n: 43-6650 4FG336FS The Eagles Code:VF-A Pilot:Lt. J. C. Norris lost in this a/c Jul 02 1944 -POW MACR-6802 & 8526. ASISBIZ I would agree with this synopsis. (b) Later this claim wasn't confirmed, but one other source said, that he had another confirmed B-24 in summer.